These are so bought, later tonight hopefully, can't wait to try these! For those interested there is audio demo's on S|C's website. The audio demo's definitely sound good. The Optimus Prime multi-effector is just what the platform needed. I've been wanting a new multi-effector for SCOPE for a looong time and this Optimus Prime seems like 'just what the doctor ordered'. dNa is releasing all the right type of plugins that SCOPE need and so far the quality is high for the plugins of dNa that I've tried. dNa - what a blessing to the SCOPE Platform! Is this this the Chistmas special or the New year special? Looks good. This is a great start for 2015! Thanks Ray!! Also check out the dNa site for more info on the new devices. By the way, what's that "genuine classic" Optimus Prime is modeled after? Music Manic wrote: Is this this the Chistmas special or the New year special? Looks good. I don't think this sale has anything to do with a Holiday, for Holidays are not even mentioned, thus I take it as just a discount sale on a new release. dNa last plugins released were on sale at release as well. But a discount is a discount whether for Holiday, loyal customer, new release, etc we still end up with the same blessing. Christmas has past so I doubt it would be a Christmas sale. IIRC in January Sonic Core has done 'Revolution Day' sale but I have no memory of a New Years Day sale. The Revolution day sale only happened for 2 years straight and doesn't appear to be for this year so far. Revolution Day sale is a extreme and insane sale were we got 12 plugins for the price of 1 and then 4 for 1. I don't believe that type of discount will continue for long if at all, and don't believe such discounts can continue to be sustained for it is too extreme thus can do more harm than good in the long run. Revolution Day sale may happen again I just don't think we'll see too many more EXTREME discounts if any, at least I hope not since such insane deals are just that 'insane', generally cause they can cause so much harm. There's good reasons most high-end companies don't operate like that. Also Revolution day sale is not promised or guaranteed so I wouldn't expect it every year. Might just be a way to get some quick cash when needed for further development. PS. But this dNa release sale is still a great one. Heck dNa plugin's regular price is very low for what you get thus I'd have no problem purchasing at regular price. This new bundle is a no-brainer purchase for me either way, especially since dNa is high-level. It has great real time parameter modulations for cool sounds when LSD is used during a tracking or mastering session. And, of course, by LSD you mean "Lysergic acid diethylamide". time I heard that one. Yes, both definitions still apply nicely! Great addition to the Scope Arsenal! dNa continues to keep the Scope platform alive with great products. Optiumus Prime is like the Transformor robot of the same name! it can morph a simple drum loop into synth lines and bass and then into realms of self oscillation ..beware amazing! Also it can do all the bread and butter as well. 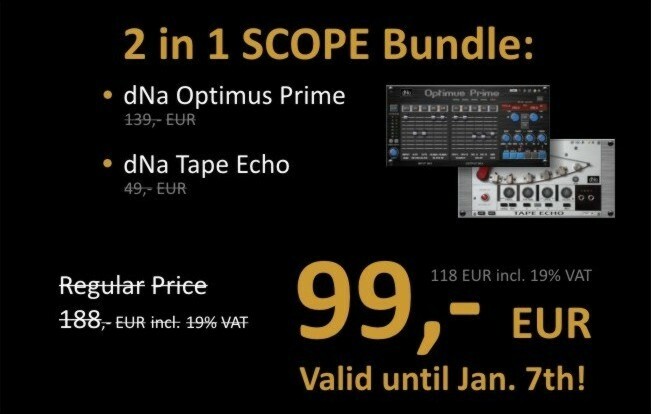 Together as a bundle they make a nice pair and they have that dNa signature analog sound. does it realtime parameter change without glitches ? I can tweak away live with no glitchs in sound under normal conditions. But Prime can get crazy when pushed. Especially with the howl(Drive) slider. It can cause feedback! There obviously is breaks ups in sound when I change presets. for those worried about the shipping bug, it should be fixed now. I saw the shipping bug too, but after careful consideration feel these prices are just too damned low. Therefore I will buy mine after the sale, so Holger and Ray can get a little more for their under appreciated work. After all, we live in an era of wealth redistribution and social fairness (no idea what that means) and wish to redistribute the wealth accordingly, only difference with me, I use my money rather than someone else's, but the directives will be met by me. Up to the next devices...keep Scope alive, but most important....make music! Any audio demos about Tape Echo?